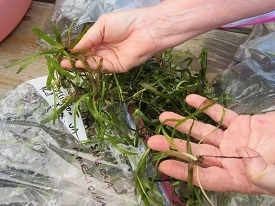 Dr. Nancy Rybicki discussed several species of aquatic vegetation with FODMers. 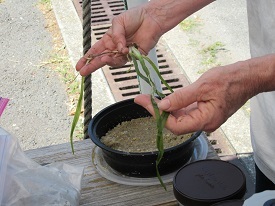 Several FODMers learned about native and non-native submerged aquatic vegetation (SAV) of Dyke Marsh and the Potomac River on July 14, 2018, when Nancy Rybicki gave a tutorial and led a paddle. Dr. Rybicki is an aquatic plant ecologist and wetlands scientist, retired from the U.S. Geological Survey. In her 37 years of studying the vegetation of the Potomac River, she has correlated the presence of submerged aquatic vegetation with water quality. Paddling near the marina and Dyke Island at low tide, the group found six species, mostly the non-native hydrilla (Hydrilla verticillata). Less than five percent was the non-native spiny naiad (Najas minor) and native star grass (Heteranthera dubia). Also present in trace amounts was coontail (Ceratophyllum demersum), southern naiad (Najas guadalupensis) and a pondweed, probably Potamogeton pusillus. The SAV in the Dyke Marsh-Alexandria area is behind this year, probably because of turbid water, but it is starting to be visible after several months of many rainy days. 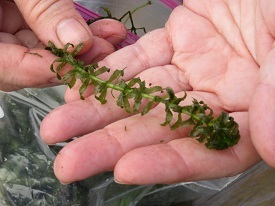 At least 11 native species of SAV have been identified in the tidal Potomac River, according to Dr. Rybicki. SAV provides habitat and food for fish, copepods and other fauna. Photos contributed by Glenda Booth except as noted. 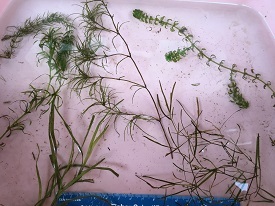 Examples of submerged aquatic vegetation. Photo by Dr. Nancy Rybicki. 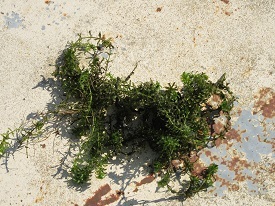 Hydrilla (Hydrilla verticillata). 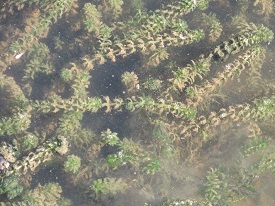 Hydrilla (Hydrilla verticillata). 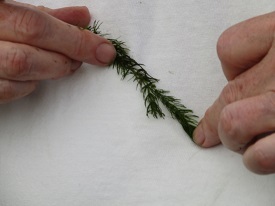 Hydrilla (Hydrilla verticillata). Coontail (Ceratophyllum demersum). Wild celery (Vallisneria Americana) found about two miles south of Dyke Marsh. Wild celery (Vallisneria Americana) found about two miles south of Dyke Marsh. 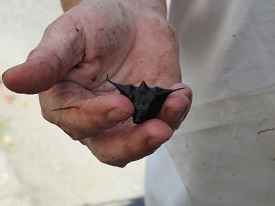 The seed of the waterchestnut with "horns." 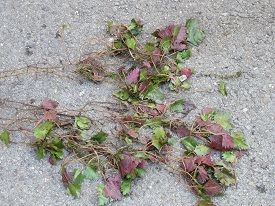 The foliage of the non-native waterchestnut (Trapa natans) found in Gunston Cove.